Lucy Walker’s Waste Land is a film about Vik Muniz, the Brazilian artist who, to put it euphemistically, uses organic matter in his art. 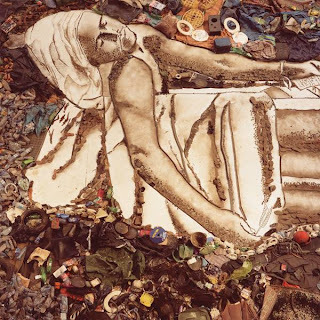 The net result of his preoccupation, which started with making portraits of children out of sugar to point out the sweetness that was missing in their lives, becomes a project based on the Jardim Gramacho, the enormous garbage dump in Rio where equality finally asserts itself when the waste produced by millionaires is mixed with that of the impoverished occupants of the favelas. The catadores who occupy the dump are pickers of recyclable goods. From the beginning, comparison with the artist is unavoidable—the artist recycles reality just as the pickers recycle garbage, transforming often-painful circumstances into beauty. The dump, in fact, looked at from afar, resembles a palette, in much the way that Monet’s water lilies assume their form when looked at from the distance. Muniz, who himself grew up in a poor family, employs extensive art historical referents. In one iconic setup, for instance, he employs a pose based on David's Marat, using a tub that has been extricated from the garbage. The dump’s resident intellectual, an autodidact who has read a volume of Machiavelli’s The Prince that he found in the detritus, compares Rio to the world of Machiavelli and its fiefdoms. The transformative power of art is another theme the film explores, since Muniz looked at the film as a social act, in which his pickers would participate in and profit from the production of art. The project that Munoz describes is utopian, in that it aims at liberation, and yet it is curiously Candidian. The film ends with Muniz offering a whole new world and life to his subjects (one of the most affecting scenes takes place at an auction in London where the work is being sold off), whose expectations are heightened and whose ability to survive without him must be a source of concern to both Muniz and anyone who views the filmic document of this esthetic and social experiment.